I don’t talk about my home life much on the blog so let me give you a little background. I am a homeschooling, stay-at-home mom to two boys ages 3 and 4. I’ve been married to Dan for almost 12 years, and we love food. However, life is busy just like any family, so as much as I love to cook and cook complex meals, I need easy meals too! 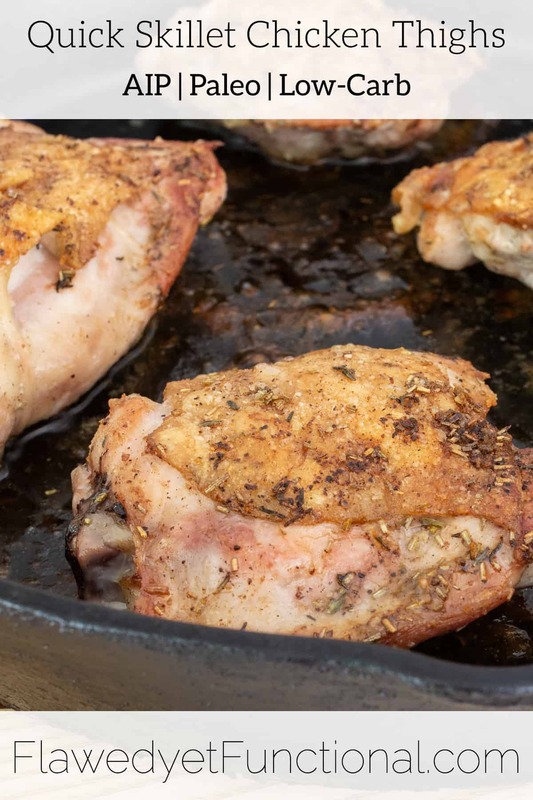 Quick skillet chicken thighs were born out of a desperate rush for dinner time one night. Change up the spices to your liking to create your own simple entree for dinner. Add a couple vegetable sides, and you’ll have a complete meal, full of nutrients, in under 30 minutes flat. To begin, you must have thawed, bone-in chicken thighs. If you freeze your meat, take it out of the freezer the day before and let it thaw in the refrigerator. Rushed on time? Take the meat out of the freezer several hours before dinner and submerge in a bowl of room temperature water until thawed. This works best if the package stays completely under water. Place a bowl filled with water on top of the package of chicken to hold it down. Rinse the chicken thighs under cold water then pat dry and lay on a clean plate. Here’s a time saver: skip mixing a spice blend in a separate bowl. 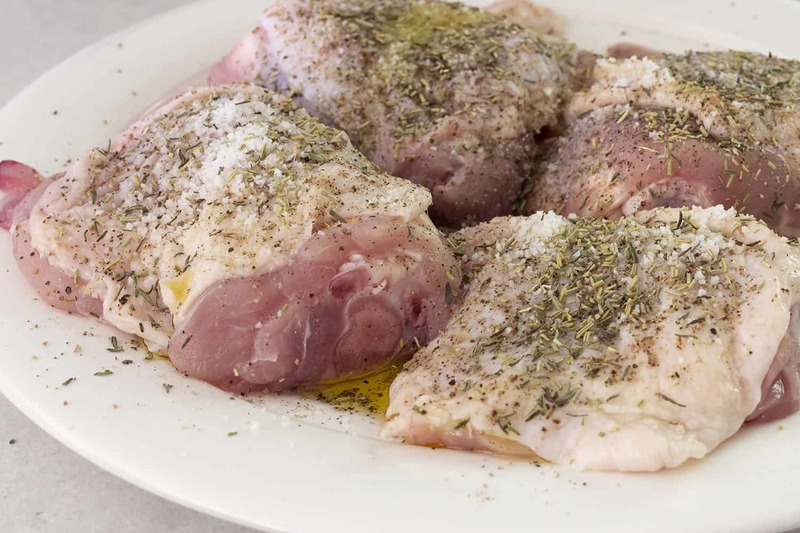 Drizzle the olive oil over all the thighs then sprinkle each spice somewhat evenly over the thighs. Remember, we’re saving time here, no need to be too perfect! Then pick up each thigh and rub the oil and seasoning on all sides of the skin and meat. Pick up as much seasoning that has fallen to the plate as you can. Don’t want to lose any of that delicious flavor! Heat 1 tablespoon of olive oil in a cast iron skillet over medium-high heat. 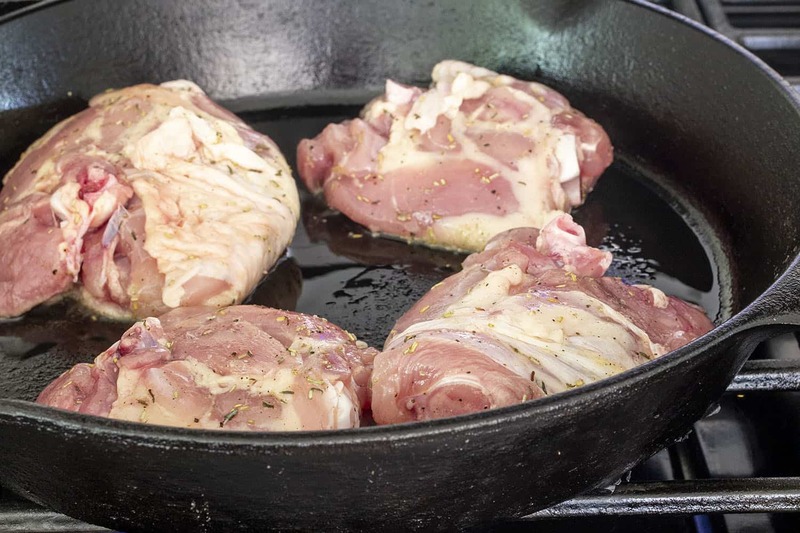 When the oil is shimmering but not smoking, place the chicken thighs in the pan, skin down. Cook uncovered for about 7 minutes or until skin is very brown and crispy. For my dinners, I try to serve two vegetables and a meat dish. While the chicken was cooking, I roasted some asparagus and sauteed Chayote squash on the stove top. What is a Chayote squash, you ask? I had no idea either! It’s one of my son’s findings/requests on a recent shopping trip. I loosely followed this recipe using lime juice instead of red wine vinegar and omitting the crushed red pepper. Plate up your crispy thighs and vegetables and enjoy! Frozen green beans – Costco sells a giant bag of organic green beans for about $6. Place in a sauce pan with 1/4″ of water in the bottom. Boil and stir occasionally for a couple minutes until heated through. Drain and season with olive oil, salt, and pepper. Bagged salad mix – Grab a bag of pre-mixed greens from the grocery store, pour in a bowl and top with oil and vinegar. If you have extra time, chop any fresh veggies you have on hand and toss on top. Raw carrots – Wash thoroughly then slice into sticks. Pickles and olives – This is our go-to combination at lunch time. Quick as opening a jar and scooping out! A quick dinner doesn’t mean sacrificing nutrition and quality! With very little planning (just thawing the chicken! 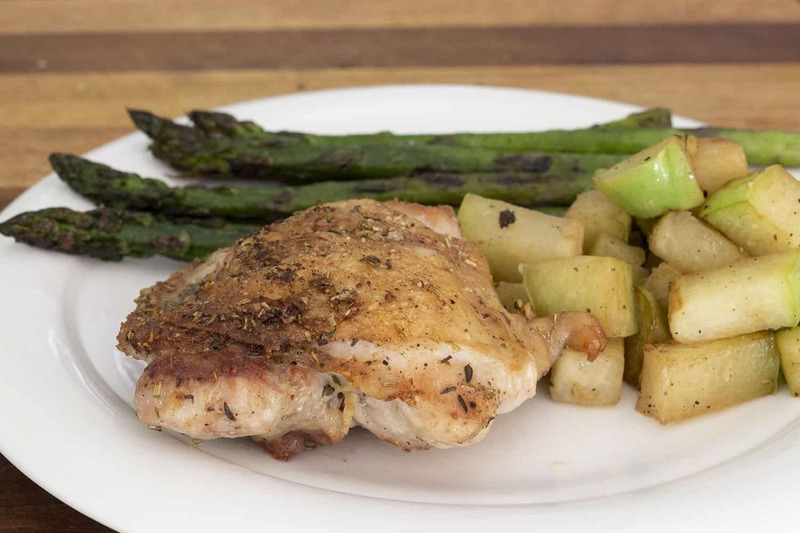 ), you can get a couple vegetables and these quick skillet chicken thighs on the table in less than 30 minutes. Enjoy! What are your go-to quick meals? Have you tried any unusual vegetables lately? 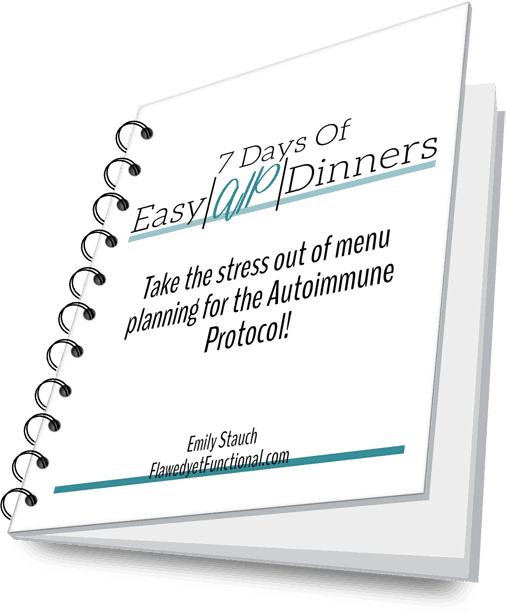 An AIP, Paleo, low-carb entrée that will please the whole family. Crispy chicken skin, does it get any better than that? Rinse chicken thighs under cold water. Pat dry with paper towel. Set on plate. Sprinkle with seasoning and olive oil. Rub spices on all sides of the chicken. 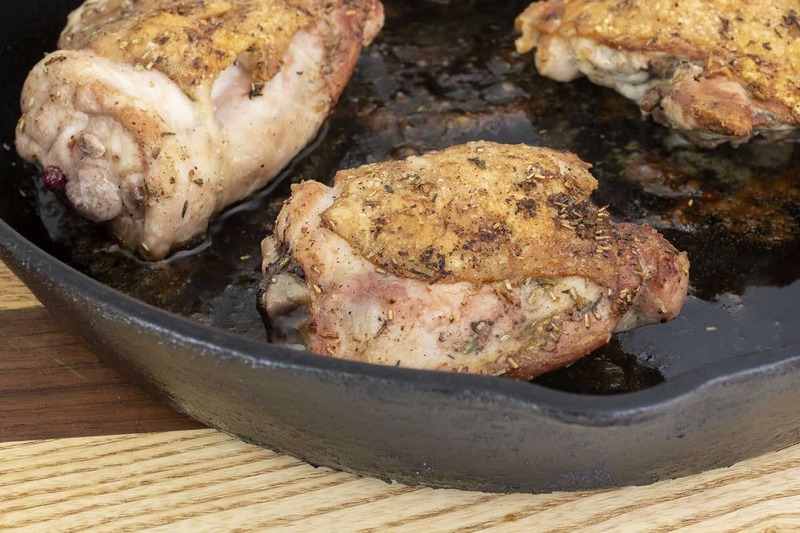 Heat a cast iron pan over medium-high heat with 1 tablespoon of olive oil in pan. When pan is hot and oil is shimmering, lay chicken in pan, skin side down. Cook for 7 minutes or so. Turn over when skin is very brown and crispy. Cook on other side for 6-8 minutes or until internal temperature reaches 165°.